Drainage management with an Ikebana flair – Johntheplantman's stories, musings, and gardening. Fixing a small drainage problem with an Ikebana flair. The rather large yard is always well kept and immaculate, but there are lots of little areas that need ‘fixing.’ This week the main emphasis was an area where soil was washing across part of a driveway and into a catch basin. The ordinary thing to do would have been to plant a row of shrubbery—but Johntheplantman doesn’t do ordinary. Ikebana is a Japanese design style that works in groups of three. The style is usually employed in flower arrangement, but I have successfully applied it to bonsai, “so,” I thought, “why not use Ikebana principles on a larger basis?” Ikebana works with levels that represent “Heaven, Man, and Earth.” It also uses triangles to emphasize the levels. I decided that a large, tree form ligustrum would serve well for the focal point of the creation. The height of the ligustrum would be the signifier for the “Heaven” level. A small, well pruned dwarf cryptomeria would be nestled in a curve on the other side of the watercourse and would signify the level for “Man,” and the dry riverbed would combine with the berms to signify the “Earth” level. 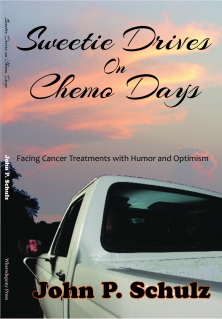 To get proper detail, I have used two pictures of the finished project. 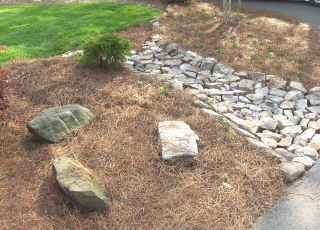 We used pine straw as a mulch mainly for color and texture. 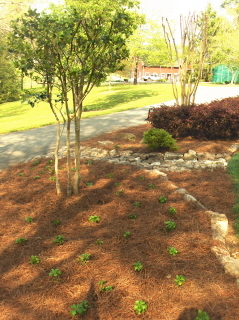 I decided to use pachysandra for a ground cover under the tree formed ligustrum. This plant will branch out and cover the area in a year or so. 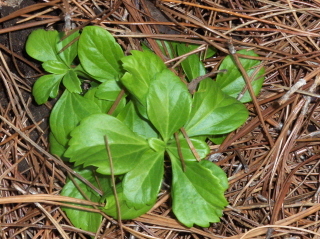 Pachysandra is a good ground cover to use for a partly shaded area. It blooms nicely in the late spring and spreads out to cover the soil rather rapidly once it is established. I like pachysandra because it covers without being invasive. If this plant gets out of bounds, it is easily maintained by pulling out the unwanted growth. 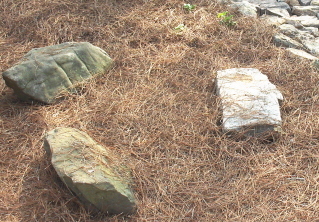 Another nice touch is the addition of three larger rocks to form an Ikebana within an Ikebana. This addition to the composition adds a smaller, almost meditative point of interest. 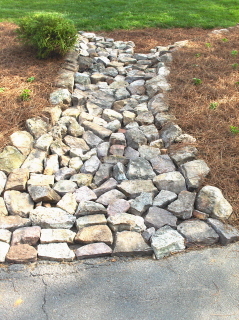 I will probably go back and put pea gravel in between the “river” rocks to enhance the effectiveness of the dry river bed. The problem should be solved. 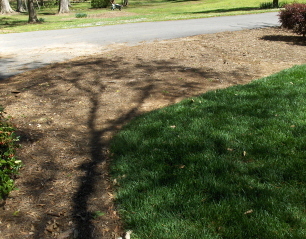 Pingback: Dealing With Dog Damage and Drainage in the Landscape | Johntheplantman's stories, musings, and gardening.